Chefs from ten countries and over 180 civil society groups have signed letters appealing to the chefs to cancel their participation in this whitewashing exercise. Following appeals from concerned members of the public, Irish chef JP McMahon announced he has withdrawn his participation from this year’s Round Tables festival. The Round Tables festival is even more tasteless as it cynically features a number of farm-to-table restaurants at a time when Israeli settlers ramp up attacks against Palestinian families gathering for the annual olive harvest and the Israeli army continues to impose a cruel siege on Gaza, pushing unemployment to 42% - the highest rate in the world. 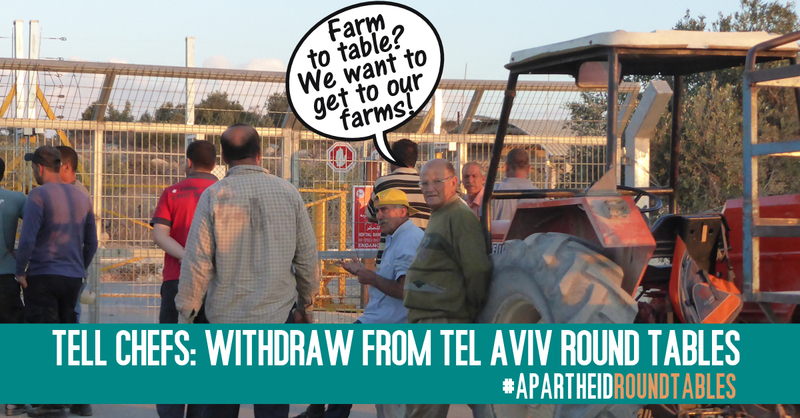 Join us in calling on these chefs not to cater to Israeli apartheid. You can help by sending a principled appeal on social media calling on the chefs to cancel their participation. Send them messages on Twitter or in their FB pages with the hashtag #ApartheidRoundTables. Tweet or post messages to the chefs and restaurants. See below for more sample tweets and posts as well as memes to share.